Constantly in demand throughout the UK and Europe, Ray & Wendy Aliker's Ye Olde Redtail Birds have appeared on National Television many times including The Disney Channel, Blind Date and Away With Worlds. They also make regular appearances on BBC Wales and local television, as well as being featured in National and Local Press... The birds even starred in the blockbuster movie Robin Hood Prince of Thieves. The only display team to have been asked to perform at London Zoo, and one of the few displays to have worked on National Trust Land. Ye Olde Redtail Falconry Display have performed in front of the queen and many other members of the Royal Family. They have also worked on the Virgin Parties by special request of Richard Branson . They are very popular with leading companies for corporate/hospitality events and schools for educational displays. The Original and still the best - One of the longest running displays in the country. 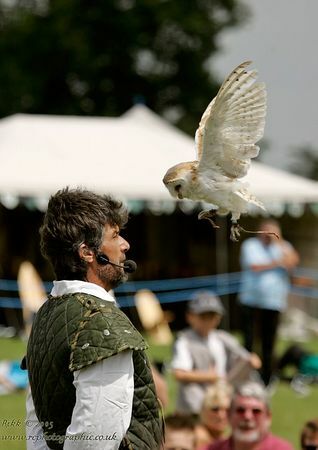 Falconry Displays for Shows, Corporate Events, Parties,Team Building, Schools and Weddings. Hawks, Falcons, Owls and Vultures. Fast, Exciting, Full of Audience Participation. Require by law that all animal acts be licensed. It is now a legal requirement for shows to make sure that any animal act has a license. Covering: Whittlesey, Stanground, Ramsey, Eye, Farcet, Yaxley, March, Wisbech, Alwalton,Harlow,Cambridge, EastAnglia ,Bretton,Stamford, Bourne, Wisbech, Peterborough,Norfolk, Scotland,Wales ,Devon, Dorset, Northampton, Kettering, Chatteris, Sawtry, Thorney, Cambridgeshire,Bedfordshire, Berkshire, Bristol, Buckinghamshire, Cheshire, Cleveland, Cornwall, Cumberland, Devon, Derbyshire, cumbria ,Dorset, East ridings of Yorkshire, Essex, Gloucestershire, Hampshire, Hereford, Hertfordshire, Isle of man, Kent ,Lancashire,Leicestershire, ,Lincolnshire, London, Merseyside, Middlesex, Northamptonshire, Middlesex, Northumberland, Nottinghamshire, Oxfordshire, Rutland, Shropshire, Somerset, Staffordshire, Suffolk Surrey, Sussex, Tyne and wear, Warwickshire, West Midlands, West Yorkshire, ,Wiltshire, Wirral, Worcestershire, Yorkshire.